Blood Orange Season (Kind of a Big Deal)Fair warning: if you have a foodie friend in your life, it's likely that they're totally and utterly obsessed with blood oranges. Like, blood orange all the things! Homemade margaritas made with fresh blood orange juice, limes, raw honey, and 100% agave silver tequila. 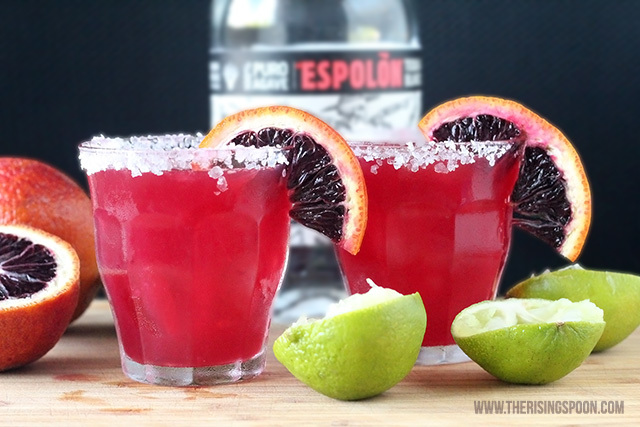 This drink recipe looks beautiful (blood oranges give it a wonderful hue) and goes down easy! Note: This recipe is very adaptable, so feel free to change the ratios of orange juice, lime juice, honey, and tequila to suit your personal taste. If you a more tart flavor, add more lime. Want it sweeter? Try extra blood orange juice or honey. Pour a circle of coarse salt into a small plate or saucer. 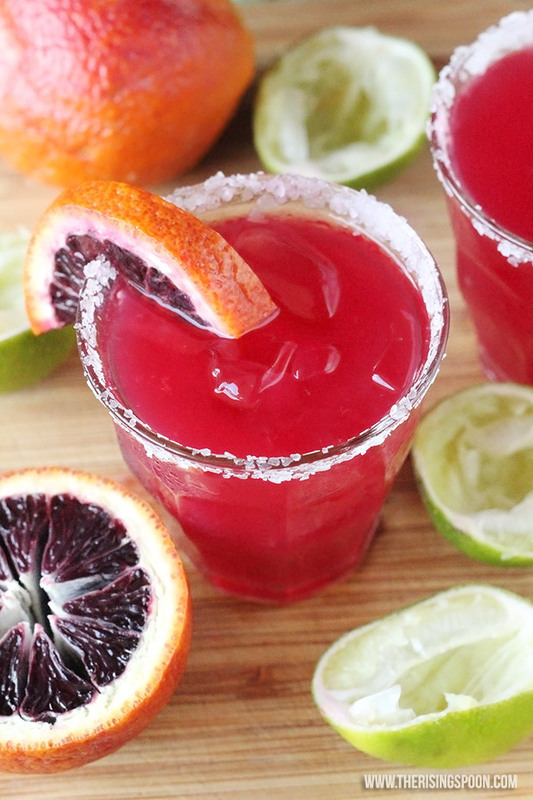 Rub a lime or blood orange wedge around the rim of your glass (or dip the rim into a small bowl of citrus juice) and press the glass' rim into the salt, twisting the glass around slightly until there's a small coating of salt around the rim. Fill your glass with ice and set aside. In a separate container, mix the tequila, orange liqueur, lime juice, and blood orange juice. If you're using fresh fruit, make sure to roll the oranges and limes out on the counter with the palm of your hand to redistribute the juices before cutting them open. Measure in the raw honey (do not heat it) and stir until combined. It may take 30-60 seconds to dissolve, possibly longer if the OJ and tequila are chilled. Optionally, top off the drink with a splash of carbonated water. If you want it extra cold, shake the margarita over ice before pouring into the salt-rimmed glass to serve. 0 Response to "Blood Orange Margaritas"